Asbestos Awareness Month has kicked off in Australia. Australia’s inaugural national Asbestos Awareness Month has kicked off, and WorkSafe has taken the opportunity to remind Western Australians about the dangers associated with this material. Lex McCulloch, WorkSafe WA commissioner, noted that the month had extra significance for residents and workers in the state as it has a history with asbestos. “Unfortunately we have the sad legacy of Wittenoom to remind us of the potential hazards of asbestos, but this has served to give us a strong commitment to the future safety and health of all Western Australians,” Mr McCulloch said in a November 4 statement. He pointed out that asbestos was used in almost every home built before 1987, so it is safe to assume that many homes contain some level of asbestos unless they were built after that year. In addition, he expressed concern that not enough people are taking enough precautions when carrying out DIY maintenance or renovation work on their homes. 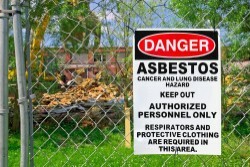 This is despite the strict licensing requirements in Western Australia regarding who can safely carry out asbestos removal. “There is still a large amount of asbestos in WA and we need to ensure that anyone who may come in contact with it is aware of the potential for serious health effects,” he said. Asbestos Awareness Month, which runs throughout the entirety of November, aims to educate Australians on the dangers of asbestos when working on homes and encourage them to seek information on safely managing it. WorkSafe cited a survey that shows 60 per cent of DIY renovators reported exposure to asbestos while working, and highlights the fact that Australia leads the world in terms of asbestos-related deaths.